It’s been a busy couple of weeks, moving quickly from my first ever sighting of an ocean rowing boat to looking at one that I’m considering buying. New website, promotional video and sponsorship brochure are all on their way, ready for a big sponsorship push in September. Things are feeling exciting and very, very busy. To get some good photos for sponsorship (and to show that I’m actually training), last week saw me setting a 3.30 am alarm for a dawn photoshoot, joined by the heroic Steve and Guthrie. 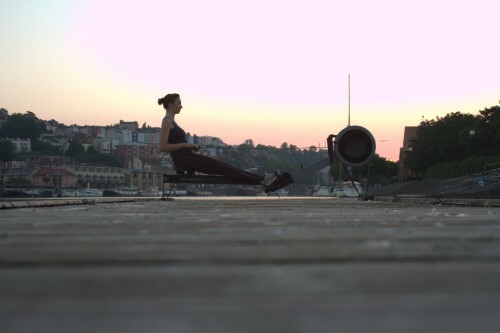 We took an ergo (indoor rowing machine) around Bristol, stopping at various points to get a good variety of shots. First stop: a floating pontoon, covered in duck poo, that rocked if I rowed too fast. Whilst waiting for sunrise, we took lots of dawn photos, watching the sky get pinker and pinker and the water lighten as night slipped away. Unfortunately, we had miscalculated the precise spot that the sun would be rising from, so ended up missing it, as it was blocked by some big trees. The next waterfront photo spot was great though, giving us some really lovely, sunny, orangey-tinted pictures. After that we rattled around Bristol, making sure to get some good landmarks behind me as I rowed. We dropped the ergo back off at the University of Bristol gym (they had kindly lent it to me overnight), and dropped the car back off before 8.30. Then we went home for a second breakfast! 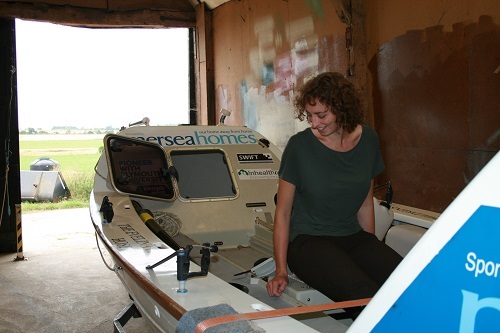 Yesterday Steve and I took another road trip – this time to go and look at a boat in Essex! It felt a bit mad to be going so far, and to be boat-shopping at all, but was also really good to see the boat I’ve been considering taking across the Pacific with me. More news and details to follow if she does become ‘the one’, but in the meantime, here I am checking her out.